MapCruzin is a family owned and operated business with a rather long web presence. We launched our first, very simple, website, the Santa Cruz Toxics Release Inventory in 1995. This was the first website in the U.S. dedicated to interactive pollution maps. In 1996 we registered the domain name, MapCruzin.com. Over the last 21 years we have gathered quite a following. Visitors to our site are interested in GIS and mapping, GPS, shapefiles, remote sensing, maps, environmental and demographic data,and Google Earth and Google Maps applications. Why do visitors come to MapCruzin.com? We are well known in the field for creating GIS shapefiles and maps, developing unique right-to-know projects, and providing timely resources related to Right-To-Know and pollution issues. Our early work provided the basis for our creating the interactive maps for EDF's Chemical Scorecard (first 2 years) and other projects. 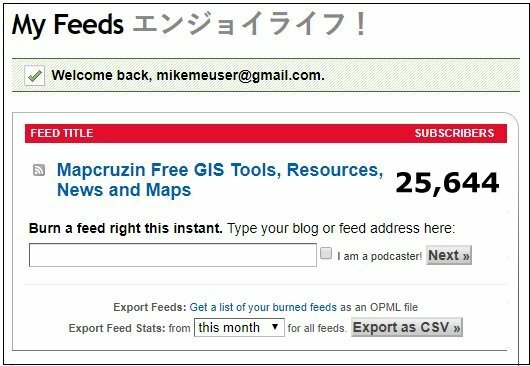 From the beginning we have been dedicated to providing environmental and GIS information, news, and resources and we have found that growing numbers of folks come to MapCruzin.com for this reason. Though our rankings and popularity within the entirety of the internet are nothing like the most popular sites like facebook.com and the like, we do very well within our niche. Over the years the number of pages on MapCruzin.com has grown to over 30,000. We also have several smaller sister-websites, a blog and a growing Facebook presence. If you don't see a format you like, or would prefer to run ads on certain pages, but not all, please contact us. Also, we have over 25,000 subscribers to MapCruzin and we would consider advertising through this list if the advertisement is related to the interests of our visitors. Advertising opportunities are limited and only available to you if you offer products, services, or information sources that are truly beneficial and are related to our goals and the interests and needs of our visitors. 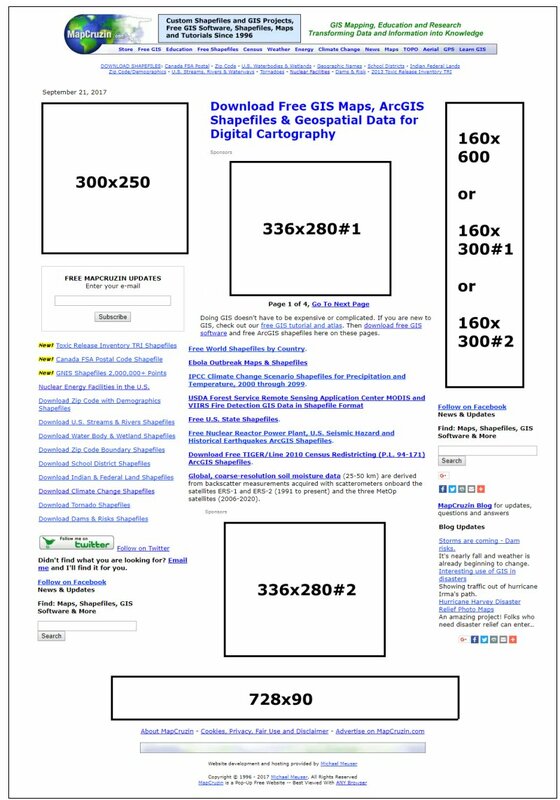 Please consult the images below for ad placement and some statistics about MapCruzin.com. Below this you will find the prices for each placement. Ad Prices Per Month - 10% discount applies to ads purchased for 6 months at a time. We also have lesser traffic sites including RecyclingSecrets.com, ToolsforSurvival.com and Climateshift.com. Advertising on these sites, of course, would be at a reduced rate.